Did you get a router for the holidays and aren't quite sure what to do next? Then our router basics class is for you. Jim will begin by discussing router anatomy, bit selection, operational safety, preventative maintenance and basic tasks you can to with your router. He'll also provide information about using a router table and highlight some of the varied and useful jobs the router can accomplish. Feel free to bring your router to class to have any questions answered about its specific controls and features. This month we are featuring a variety of woodworking projects made by Paul Burri, who rarely makes anything "bigger than a breadbox" but likes to make more unusual and unique things. This month we are featuring the spoon carvings of Robert Wagenseller, who carves spoons of all different shapes and sizes out of various kinds of wood. He has carved over 500 of these spoons during his lifetime and doesn't plan on stopping anytime soon! This month Jim discusses shop lighting and different sources for it, as well as a money-saving tip on ways to improve light "reflection" to help make your shop brighter. Each month we're featuring one of our many spectacular Festool power tools and highlighting it with a video product tour. This month we're featuring a Highland Woodworking product tour of the Festool Kapex Sliding Compound Miter Saw with Steve Johnson, where he takes a hard look at the features of saw, and addresses the question: "Is it worth the extra cost compared to ordinary compound miter saws?" Question: Some finishes may react with other finishes. I was wondering if I could use lacquer on top of danish oil or wiping varnish? This book's title somewhat understates the breadth of its contents. It certainly does cover the uses of handplanes of all sorts in the woodshop, be it a hybrid shop or one totally free of powered machinery. But the book offers far more than that. It's a feast of information about handplanes that ranges from types of planes and their uses to buying, restoring, collecting and troubleshooting. If you've ever wanted to get started in woodcarving, then you'll want to check out this review of the Record Power 12-Piece Carving Chisel Set with Quickstart Guide and DVD. Jeff explains what comes with the set and then describes his experience using the included tools and following along with the accompanying DVD. This month, Gerry Anger has a woodworking safety tip on the installation of a separate power switch for your woodworking equipment. This month we are featuring John Labie's workshop in Tallahassee, FL. The Millennial Generation – What Does It Mean For Woodworking? Can't/Don't, Never Have, No Talent Wood Carving! This month, Steve continues his discussion on remodeling vs. woodworking by introducing the STARR formula for demolition. He also explains how he gets the "perfect fit" for the installations of his new bathroom vanity project that he has been working on. Steve also brings up the topic of the Millenial Generation and how it has affected woodworking (think IKEA). Lastly, he has found a new love in woodworking that he never thought he would enjoy - carving. This month, Andrea spends a day in the shop with Katie Jackson, who is is an "inspiration, a do­er, active in building community, mentoring and teaching others" in the craft of woodworking. Katie is also finishing a book, Hand-Built Outdoor Furniture: 20 Projects Anyone Can Build , to be released in April. Katie's project for the beginning woodworker is a Shaker Pegboard Shelf project, which she discusses how to make within the article. If you've ever had the pleasure of dealing with flame cuts or burls on antique furniture, I'm sure you are well aware of the challenges these beautiful cuts have to offer. Although they can be a challenge to glue back down, there are a couple of tricks to keep these veneers in place. Every year we invite our bloggers to share their resolutions, specific to their woodworking goals for the new year. Click the link to read their woodworking resolutions and send us an email if you have any of your own! What clothing do you wear in your shop? In this month's poll, Jim Randolph asks "What clothing do you wear when you're working in your shop?" Like all grandfathers, Forrest Bonner enjoys making woodworking projects for his grandchildren. This month, Forrest creates 2 Karate Belt Displays for his granddaughters to show off all of the belts they have learned, including their junior black belt! I'm a beginning woodworker. Like you, I want to make things, beautiful and functional things that will last. And like a lot of beginners, one of the first big projects I tackled was a workbench, because everything is easier when you have a sturdy, horizontal surface to work on. I'm publishing the plans for this bench for your downloading enjoyment, so this article is more intended as a collection of helpful tips and lessons learned, rather than a step-by-step. Click below to watch Matt Cremona show off several different hand tools from Blue Spruce Toolworks, including their Set of 4 Dovetail Chisels, Joiner's Knife, and the 1 Ib. Round Mallet. Lie-Nielsen has turbo-charged both the design and quality of the long lived, economy made, side-clamp style honing guides. Impeccably crafted from stainless steel, this L-N guide has a bronze bearing for long life. A finely threaded main screw precisely moves the guide's standard jaws for clamping to the edges of your irons up to 2-3/8” wide and for chisels as narrow as 1/4”. A bronze knurled knob with driver slot lets you snug the jaws in place. Unlike honing jigs with a wide wheel, this jig's narrower wheel makes it easy to steer the jig with finger pressure, should you want to add camber or ease the outside corners of your irons. Rikon's model 10-341 18" bandsaw offers greater capacity than other bandsaws in this price range. It has everything you could want in a serious bandsaw - 19" x 17" table with a 45 degree right tilt and -1.5 degree left tilt, Quick-release fence, 13" high by 17-1/2" wide cutting capacity, quick-release blade tension, double bearing blade, sight window in the hinged blade guide, two 4" dust ports can be attached to your dust collection system, and much more! Shortly after Woodpeckers released the popular MT Center Gauge a couple years ago, customers were clamoring for the perfect accessory — a Doweling Jig. So a few months later, Woodpeckers offered the companion tool. 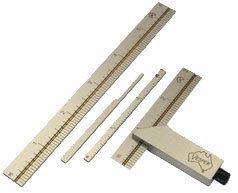 But as OneTime Tools, many woodworkers missed out owning the complete kit. Now you can order the horse, the carriage or the whole shebang. Find more space in your workshop by mounting some of your big tools onto these handy steel mobile bases. After moving a machine into position, you can lock it firmly in place by flipping the mobile base's two quick-action levers, allowing the tool to rest securely on adjustable rubber leveling feet. Fits up to 31" x 31" square or a 14" x 35" rectangle. Handles up to 400 lbs. Bad Axe's goal is simple: To make handsaws like those from a traditional 19th century American sawmaker's shop. In our opinion, they have wildly surpassed that goal in creating these handsome to the core, heirloom quality handsaws. Bad Axe handsaws cut beautifully, tracking to your cut lines with uncanny precision. Their effortless, drift-free sawing, will increase the accuracy of your work; delighting experienced hand tool users and exciting newcomers who have struggled getting accurate cuts using ordinary handsaws. Rikon's new 25-130H 13" thickness planer with helical-style cutterhead is a beefy benchtop unit designed to perform reliably either at your workshop or job site. The unit comes with 26 two-sided HSS indexed cutting inserts arranged in straight rows in a staggered pattern around the cutterhead in a way that greatly reduces noise as well as improving chip removal compared to planer knives mounted in a conventional cutterhead. Note that the cutting edges are NOT positioned at a shear angle to the stock on this cutterhead. The Festool Centrotec Installer's Set is back and better than ever! Festool has adjusted the kits to fits the needs of most American craftmen. (They added square drive bits!) As ever, it includes a huge collection of Festool drill and driver bits to meet almost every need. You can drill holes (in inch sizes!) and drive screws (Phillips, Square Drive & Torx). You can even drive nuts and bolts with the socket adapters. Our most popular 14" bandsaw is now on sale for the exceptional price of $699.99 while our limited sale quantity lasts. The Rikon 10-325 is powerful (1-1/2 HP motor), strong (steel frame construction), accurate (double bearing blade guides) and a genuine pleasure to use, with full 13" resaw capacity and a 5-year warranty. This is an incredible value.